In June 2012, I acquired a previously unknown oil painting by the Italian artist, Costantino Proietto (1910–1979). As soon as my new painting arrived, I shared pictures and descriptions of it on this website. The painting is of the Tiber River and St. Peter’s Basilica in Rome, Italy. Angled gracefully into the scene are the Castel Sant’Angelo and its attendant bridge, the Ponte Sant’Angelo. In addition, a statue of Archangel Michael unsheathes his mighty sword atop the castle. Soon after publishing that article, I received an email from yet another owner of a C.Proietto painting. Mr. Craig Casey of San Diego had acquired his painting at a friend's moving sale. From images of both the front and back, I was able to study the Casey painting. Although the age of the painting soon became apparent, I could not determine the scene’s geographical location. 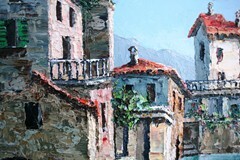 Knowing that the artist painted real scenes, I searched both my C.Proietto archives and internet photos of Swiss and Italian lakeside villages. During my search, I found only one C.Proietto image similar to the Casey painting. Both paintings featured large, wide-angle views of lakeside villages. The archive painting has a handwritten label, perhaps by the artist. It reads, “Lago di Lugano Gandria”, which translates in English to, “Gandria Village, Lake Lugano”, Switzerland. After viewing hundreds of Gandria Village photos on the internet, I found that the Casey "Villa di Lago" painting was not a match. Although the artist had painted scenes of Lago di Como, Lago Maggiore and Lago di Lugano, I could not place the Casey painting at any such location. Here, I ask for help from any reader who recognizes this lakeside scene. Please comment below or send an email with geographical candidates for this C.Proietto painting. I will be happy to credit whoever first helps to solve my C. Proietto location mystery. The Casey C.Proietto is a moderately large example of the artist’s work. Most C.Proietto paintings have an aspect ratio of 4:3. Not surprisingly, that ratio is close to that of 35-mm film (4.11:3), from which the artist worked. Originally, the Casey painting was 40” x 20”. During an earlier reconditioning of the piece, someone used shorter, 38” Grumbacher stretcher bars. That action reduced the visible width of the painting by almost two inches, partially obscuring the “C” in the artist’s “C.Proietto” signature. This wide aspect ratio is a clue to the age of the Casey C.Proietto. By 1956, Cinemascope and Panavision lenses, with aspect ratios of almost 2:1 had influenced all the visual arts. Instead of tall, boxy layouts, new paintings, live stages and movies began retooling toward wider, horizontal formats. During his 1957 visit to Southern California, the artist may have viewed wide-screen movies and other examples of this trend. In addition to its wide angle view, the entire composition has a left-standing perspective. Rather than a vanishing point in the center of the scene, we look from left to right and then to the far shore to see the painting as the artist intended. By mid-century, C.Proietto had painted hundreds, if not thousands of original compositions. Thanks to Mr. Casey’s clear photography, we can see many details of the artist’s work. As testament to the Proietto’s technique, many flourishes of his palette knife still stand in raised relief. Over one half century after creation, small waves of paint still curl and shine. After World War II, the reintroduction of foreign trade brought brighter, more durable paints to Proietto’s studio in Stuttgart, Germany. The high quality paint in this piece again indicates a late 1950’s date of origin. On the back of the canvas is another clue to the age of this painting. Still showing traces of the artist’s wax seal, a printed tag adheres to the back of the canvas. First utilized by the artist in the 1950’s, printed tags, seals and the occasional “Certificate of Authenticity” point again to a date of 1957 or later. 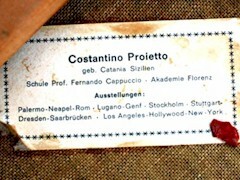 In 1957, Costantino Proietto visited the U.S., spending time with American cousins on either coast. During that trip, he completed his U.S. gallery representation, including exhibitions in New York, Los Angeles and Hollywood. With its mention of Los Angeles and Hollywood, this tag points to a date of origin in 1957, or later. On all of his printed tags, Proietto gave credit to “Prof. Fernando Cappuccio” of the Academy of Art, in Florence, Italy. Until now, the only mention of “Prof. Fernando Cappuccio” on the internet was from a 2006 C.Proietto auction. Born in Catania, Sicily in 1910, Proietto began his apprenticeship to Prof. Cappuccio in 1924. Their long association left little time for either man to teach or study at the academy. Perhaps the professor left the academy in 1924, at which time he accepted a commission to restore the Basilica of Saint Mary, in Randazzo, Sicily. During that restoration, young Tino Proietto learned the craft of “spaddle work”, as he later referred to his impasto technique. Soon after seeing pictures of it, I offered to purchase the Casey Family C.Proietto. Three days later, the brilliantly mysterious “C.Proietto” arrived at my door. The late Will Rogers said, “I never met a man I didn’t like”. After studying the work of Costantino Proietto for the past year, I can safely say, I never saw a C.Proietto in person that I did not love. After less than one week of enjoying this lakeside village scene, I believe it to be yet another Costantino Proietto masterpiece.